Holly never knew her late husband had an identical twin until the man showed up on her doorstep, demanding to help raise her twin sons. Will the secret he keeps stop him from winning her heart? Once, all Ellie Porter wanted was Conor Kavanagh, but a decade later, this single mom needs him for one thing only—to save her brother. As old passion rekindles, will Conor save her, too? When college professor Brooke Davis falls for the mysterious Nic Alessandro, little does she know he's actually the prince of a small European country and their romance is about to leave her with an heir to the throne! 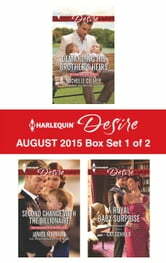 Look for Harlequin® Desire's August 2015 Box set 1 of 2, filled with even more scandalous stories and powerful heroes!